Volatility returned to global markets in February, but by and large, emerging markets proved resilient. Franklin Templeton Emerging Markets Equity Chief Investment Officer Manraj Sekhon and Director of Portfolio Management Chetan Sehgal present an overview of emerging-market developments in February, including some events, milestones and data points to offer perspective. China announced plans to eliminate term limits to the Chinese presidency, suggesting President Xi Jinping could seek to serve beyond the end of his second term in 2022. This development could be generally positive over the short-to-medium term as top leadership will remain stable and major government policies could be more consistent. President Xi’s goals are ambitious and many of his initiatives require time to be completed. However, structurally, this is a significant change from the “collective leadership” of the Chinese Communist Party that was introduced by former leader Deng Xiaoping, and it could raise the risk of policy errors in the absence of checks and balances. This is something that will need to be closely watched over the longer term. International ratings agency Standard & Poor’s raised Russia’s sovereign credit rating to investment grade, while Fitch reaffirmed the country’s investment-grade rating with a positive outlook, raising the possibility of fund flows and validating the country’s efforts to stimulate economic growth. After two consecutive years of contraction in 2015 and 2016, the Russian economy returned to growth in 2017, supported by consumer demand and a rebound in commodity prices. The Russian market remains one of the most lowly rated emerging markets, trading at a price-to-earnings ratio of 8 times as of end-February. We maintain a positive view on the market, focusing on companies in the information technology, financials, energy and materials sectors. 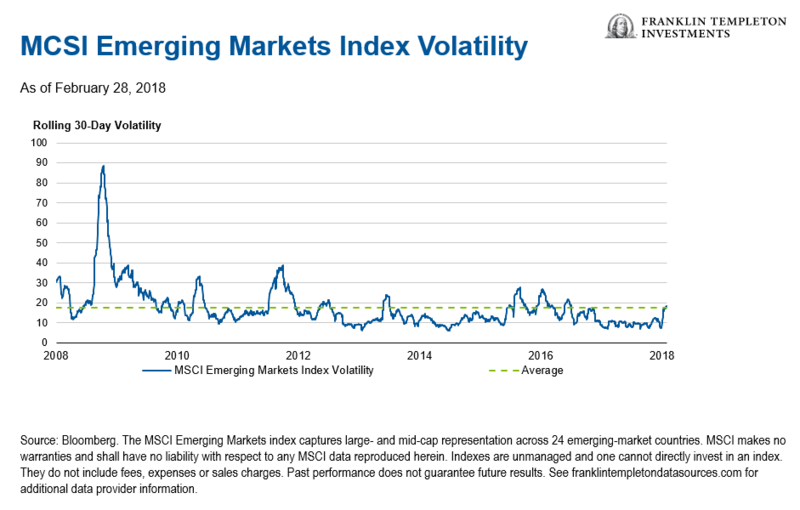 While volatility has heightened recently, we believe that emerging-market (EM) fundamentals remain sound. We believe EM equities have reached an inflection point in regard to earnings and appear to be providing us with valuation opportunities we do not generally see in most developed markets. Our view is that earnings should continue to recover and prompt valuations to return to a more normalized level. Discounted valuations are one of several trends that underpin the upside potential we see in emerging markets today. Other positive trends include undervalued EM currencies and lower EM debt levels. When making a case for emerging markets in the year ahead, we believe foreign reserves should not be underestimated. Previous financial crises have been exacerbated by insufficient foreign reserves and the inability to manage domestic savings. However, we believe emerging markets are in a much stronger position today, with their foreign reserves now exceeding those of their developed-market peers. Global markets experienced a selloff in February as worries of resurgent US inflation outweighed initial optimism about an improving world economy. Volatility spiked as investors assessed the likelihood of major central banks stepping up the pace of monetary policy tightening. Emerging markets recorded a sharp but brief correction before rebounding in the latter part of the month to recover some of the losses. As a group, emerging markets finished slightly behind their developed-market counterparts in February. The MSCI Emerging Markets Index declined 4.6%, compared with a 4.1% correction in the MSCI World Index, both in US dollars.3 Higher risk aversion, lower oil prices and weaker EM currencies weighed on EM equities. In Asia, most markets lost ground amid the global stock market rout. India, China and South Korea posted the largest declines. India was particularly hampered by the government’s reintroduction of a long-term capital gains tax on equities. A move by three local stock exchanges to end licensing deals with their foreign counterparts and rein in offshore derivatives also hurt sentiment. In China, slower-than-expected growth in manufacturing activity in February raised caution around the country’s economic momentum. Conversely, Thailand finished higher. The country’s exports surged past forecasts in January to notch their fastest rate of growth in more than five years, underpinning the government’s robust economic outlook for the year. Latin American markets corrected over the month, but as a group they performed better than their EM counterparts. Brazil and Peru were among the leading regional performers, while Colombia and Mexico lagged. Depreciation in the real accounted for the decline in the Brazilian market as lower-than-expected inflation, strong economic activity and a reduction in the benchmark interest rate to a record-low level provided investors with reasons to maintain a positive view and overlook disappointing fourth-quarter GDP growth data. In Mexico, lower manufacturing and consumer confidence data coupled with monetary policy tightening weighed on equity prices. A decline in oil prices impacted stock prices in Colombia, despite a strengthening peso. Central and Eastern European markets were among the worst EM performers with Poland, Hungary and Greece especially weak. The Turkish market also declined but outperformed its EM peers, as attractive valuations and earnings growth supported investor confidence. Russia bucked the global trend, ending February with a gain following a recovery in equity prices in the latter part of the month, driven by higher earnings growth prospects and undemanding valuations. South African and Egyptian equities edged down in February but fared better than their EM peers. Investors cheered the swearing-in of African National Congress (ANC) leader Cyril Ramaphosa as South Africa’s new president following the resignation of Jacob Zuma. A cabinet reshuffle that brought back Nhlanhla Nene as finance minister and Pravin Gordhan as public enterprises minister was also well-received. The Central Bank of Egypt adopted an easing monetary policy in February, with a larger-than-expected 100 basis-point interest-rate cut, thus providing the market with the hope of accelerating GDP growth with decreasing inflationary pressures. In February, frontier markets outperformed their EM counterparts, driven by fund inflows and improving earnings growth. Kazakhstan, Kenya and Kuwait were among the top frontier-market performers, recording positive returns. In contrast, Argentina was among the weakest, impacted by profit-taking after strong performance in 2017, concerns surrounding wage negotiations and inflation, as well as plans to scale back and delay labor reforms. 1. Source: International Monetary Fund, “GDP based on PPP, share of the World,” data as of October 2017. 2. Source: International Monetary Fund World Economic Outlook Update, January 2018. There is no assurance that any estimate, forecast or projection will be realized. 3. The MSCI Emerging Markets index captures large- and mid-cap representation across 24 emerging-market countries. The MSCI World Index captures large- and mid-cap representation across 23 developed-market countries. MSCI makes no warranties and shall have no liability with respect to any MSCI data reproduced herein. Indexes are unmanaged and one cannot directly invest in an index. They do not include fees, expenses or sales charges. Past performance does not guarantee future results.